The loss of knowledge and educational skills during the summer months is cumulative over the course of a student's career and further widens the achievement gap between low- and upper-income students, according to a RAND Corporation study issued today. The study confirms that students who attend summer programs can disrupt the educational loss and do better in school than peers who do not attend the same programs. "Despite long-term efforts to close the achievement gap between disadvantaged and advantaged students, low-income students continue to perform at considerably lower levels than their higher-income peers, particularly in reading," said Jennifer McCombs, study co-author and a senior policy researcher at RAND, a nonprofit research organization. "Instruction during the summer has the potential to stop summer learning losses and propel students toward higher achievement." The study, commissioned by The Wallace Foundation and conducted by RAND Education, is the most comprehensive research on summer learning to date. Using extensive analysis of existing literature combined with field research, the study examines student summer learning loss and gain, the characteristics of effective summer learning programs and the costs associated with such programs. It also gives specific recommendations on how school districts can overcome barriers to establishing successful programs. "It is becoming increasingly clear that the conventional six-hour, 180-day school year is insufficient to give many disadvantaged students the education they deserve," said Nancy Devine, director of communities at The Wallace Foundation. "This long-awaited and timely RAND study, 'Making Summer Count,' confirms the disproportionate impact of the 'summer slide' on low-income students, and suggests that high-quality summer learning programs, though challenging to develop, are a promising path forward." Researchers find that not all summer learning programs provide equal educational benefits to students. Moreover, many programs suffer from low attendance. Researchers find that students experience the most benefits when the summer programs include individualized instruction, parental involvement and small class sizes. Despite the clear benefits from these programs, according to the study, many school districts question the cost-effectiveness of summer learning programs and a significant number have discontinued them as a result of budget cuts. While a day of summer instruction costs less than a day of instruction during the school year, summer learning programs are an additional cost. The researchers found that cost is the main barrier to implementing and sustaining summer programs. "One way school districts can make summer learning programs affordable and more effective is by partnering with community-based organizations," said co-author Catherine Augustine, a senior policy researcher at RAND. "They are often less expensive than school district staff, and they offer enrichment opportunities that are often similar to those experienced by middle-income youth during the summer — such as kayaking or chess, for example — that encourage students to enroll and attend, both of which are critical to program effectiveness." Invest in highly qualified staff and early planning. The more-successful providers developed well-structured programs that attract students to enroll and attend, and they recruited quality, dedicated staff with time to devote to planning and programming. Apply "best practices" to summer learning programs, such as providing smaller class sizes, getting parents involved, giving individual instruction and promoting maximum attendance. Give strong consideration to partnerships, which enable the creation and sustainment of high-quality voluntary summer learning programs. Various organizations offer different sets of resources and skills that can bolster a summer learning program. Partners may include community-based organizations, private summer learning providers, and city and local governments. Think creatively about funding sources, such as hiring AmeriCorps members and hiring teachers who need administrative hours as summer-site coordinators. 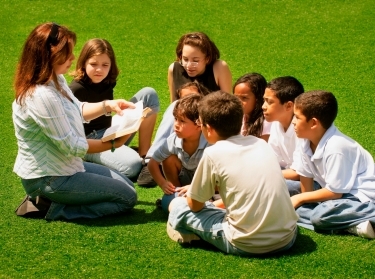 There are more than 100 funding sources that can support summer learning programs. Researchers also recommend that policymakers at the federal, state and local levels continue funding summer learning programs, and clarify the extent to which existing funding sources can be allocated toward summer programs. "Summertime offers an opportunity to help bridge the achievement gap and the opportunity gap," McCombs said. "Summer learning programs can give students the chance to master material they did not learn in the previous school year, prevent learning loss, propel learning gains and provide low-income students with enrichment opportunities similar to those experienced by their middle-income peers." The full report, "Making Summer Count: How Summer Programs Can Boost Children's Learning," is available at www.rand.org and www.wallacefoundation.org. RAND Education, a division of the RAND Corporation, is a leader in providing objective, high-quality research and analysis on educational challenges that is used to improve educational access, quality and outcomes in the United States and throughout the world.